That might be the most explosive line in the book, but it certainly grabs one’s attention and pulls the reader into this world of coveted signed first editions, calfskin bindings, and suppressed manuscripts. First person narrators, with their intense introspection, can be exhausting. Morrow’s narrator is no exception. He scrutinizes and delivers his every thought and move in exacting detail. Morrow, however, uses this device to excellent effect. 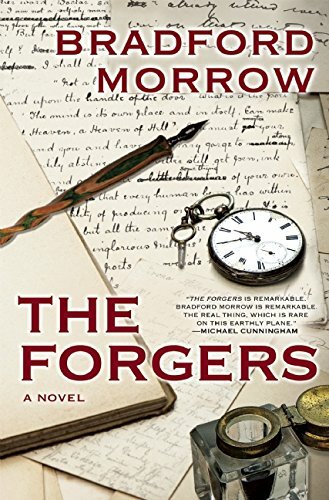 The unctuous, somewhat creepy narrator of The Forgers, a forger himself, oils his way through the aftermath of the murder of Adam Diehl, a fellow forger and brother of the woman the narrator loves and, soon after her brother’s death, marries. First person narrators are also inherently unreliable. Did Morrow’s narrator commit the murder, readers will wonder from page one? Seemingly not. But maybe. Then again . . . Tension builds, but we cannot ignore the obvious: all the “facts” are being filtered through a forger who lies repeatedly to friends, his wife, his employer . . . The “gotchas” when they come are pale and polite, much as one might picture a collector of rare books. Most of the action in this novel takes place internally, the mental gyrations of the narrator as he carefully constructs his story for us. “History is, finally, little more than modeling clay in a very warm room,” the narrator reminds us. Or does he mean, his story? “Forgers are superb obsessives,” the narrator also notes. “And because they disrespect the law, by definition they are dangerous obsessives . . .” The level of our narrator’s self-scrutiny demands that we apply this truth, which he directs at two of his rival forgers: the murdered man and the narrator’s blackmailer, to the narrator, as well. He is, after all, so self-obsessed that he can’t resist offering the world his “art,” forging signatures on rare books, thereby sullying the items he professes to love. While this narrator is difficult to warm to, Morrow’s language is so pitch perfect, his metaphors so startling, and his truths so pithy that you continue to listen to his tale with a growing fascination and unease.